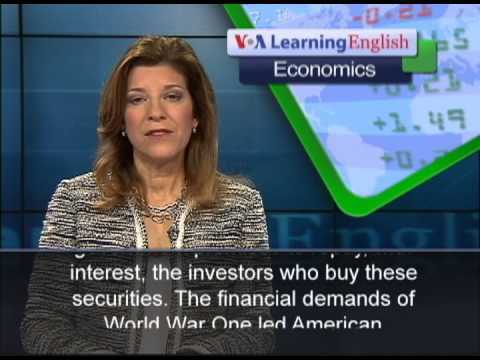 Subscribe to the VOA Learning English Channel: http://youtube.com/voalearningenglish | Like us on Facebook: http://facebook.com/voalearningenglish From VOA Learning English, this is the Economics Report. There has been a lot of talk about the "debt ceiling" in the United States. The debt ceiling is a legal limit on how much the federal government can borrow. Political disputes over that amount have concerned investors in recent weeks. American lawmakers must negotiate a new debt ceiling every time the federal debt reaches that legal limit. National debt grows when a government spends more money than it has available. Governments offer bonds and other investments to raise money to pay for this spending. In return, the government promises to repay, with interest, the investors who buy these securities. The financial demands of World War One led American lawmakers to establish a total debt limit. In 1917, Congress agreed that the president could borrow up to a set amount without seeking approval. Congress has agreed to change the debt limit 10 times since 2001. But the major parties may disagree on spending levels or on the need to borrow to pay for government operations. Other nations buy United States Treasury securities because they are considered the safest investment in the world. The partial shutdown of the federal government led to worldwide concern about the safety of these investments. Congress agreed to re-open the government without enforcing the debt ceiling only one day before borrowing reached the legal limit. Lawmakers agreed to let the president decide what the Treasury Department could borrow through February 7th. Congress must now negotiate a new debt limit and resolve other budgetary issues in order to avoid another crisis. For VOA Learning English, I'm Carolyn Presutti.